I wonder if I might trespass on your valuable time this week for a spot of shameless self-promotion on behalf of Caithness Archives? You see, we’ve started an ambitious new web project, a blog, in which we’re going to tell the history of the county of Caithness throughout the Second World War in real time, week by week, using only original sources. These include archives such as diaries, police and Home Guard records of air raids and submarine sightings, council minutes, local newspapers and school log books. Now, given that the Second World War lasted some six years, we’re talking possibly three hundred weeks’ worth of entries to write – but hey, you’ve got to aim high, right? Anyway, you can see the blog if you’re interested over at Caithness at War. It will be updated each Monday, just like this one. Where was I? Oh, yes. 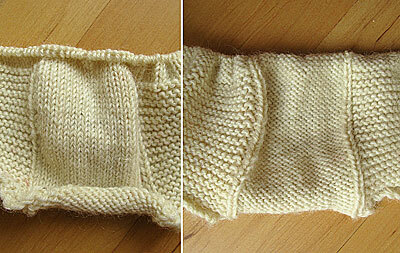 I have finished the welt, just over two inches of garter stitch knitted in the round, with the usual fake seams. I’ve now embarked on the one inch of plain knitting before the pattern starts (I’ll chart out the body pattern in next week’s blog.) 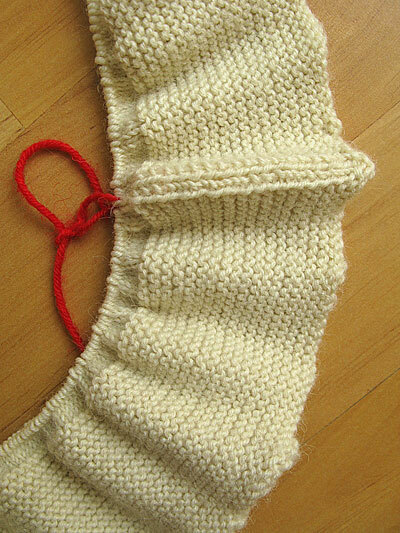 The steek is becoming clearly visible, 18 stitches of stockinette with a purl stitch delineator on either side. I like the curve of this kind of welt. It reminds me of the way each stage of a Saturn V rocket bulges out from the one above. In fact I am now inspired to develop and patent the world’s first Saturn V gansey costume for children, worn head to toe; the only downside being it would resemble a giant novelty condom, with perhaps unfortunate misunderstandings and lawsuits to follow. As I mentioned in the comments last week, the problem with so much purling was that it highlighted a flaw in my technique – so my right index finger kept catching my left thumbnail. Not that each contact was especially painful in itself – rather, the cumulative effect was unpleasant, like the water torture, drop by drop. Right. Back to work to research another week of Caithness At War. Right now things look black for our heroes – I do hope it has a happy ending. Caithness at War looks like it’s going to be an interesting historical lesson, and when you say “we’re going to blog . . . .” – how many writers are involved in the actual blog writing? I just hope “they” are as captivating writers as yourself in order to keep “us” tuning in each week. The anticipation builds to the unveiling of the pattern of the new natural colored gansey. I know how well that color shows the pattern from your previous Hebrides ganseys. The Caithness at War blog looks great. Will be recommending it to several friends. I’ll have my hands over my eyes (peeking through my fingers of course!) as you cut the steek. You do fabulous knitting! Well, to tell the truth, so far it’s just me doing the actual writing – though that will change as it develops, hopefully. Of course, as it’s an official council project, I have to rein myself in a bit and keep my facetious side carefully hidden! But mostly it’s just a question of cueing up the documents, which speak for themselves. I’m still amazed at how well cream shows the patterns, especially the more intricate ones. Though part of me still feels that navy blue is more “correct”. ” . . . so you get the spendid “skrunk” noise of scissors cutting fabric on wood…” Also the sound of Gordon quietly whimpering in the background as Margret does the actual cutting. I’m intrigued by this sweater, Gordon. 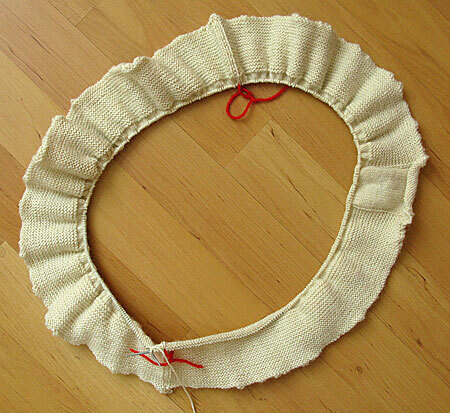 I can’t imagine such a large garter welt fitting into one of your sweaters. Looking forward to seeing it evolve. It also interests me that some people see the color as stark. To me it looks like a warm fluffy lamb. It’s interesting how each of us sees things differently. every now and then i cheer myself on by accessing different views of your finished ganseys .gordon…silly, but they do keep me going with the thought that some day, some year my own gansey will be finished! I feel that i have earned some sort of gansey knitter’s medal of valour; i first knitted three welts before i had correctly finished the section that now preceeds the body of the sweater! [oh, don’t ask, but suffice it to say that i broke 3 pairs of circular needles during the above processes]. The kind of cool thing is that, after this baptism of fire, i feel that i really am a knitter and a damn good one at that! I think it’s the willingness to suffer that differentiates the gansey knitter from any other, so i happily join ranks with y’all out there pursuing the perfection of 9.5 perfect stitches to the inch! linda c. by the by, wonderful idea of real time wwtwo blog! oh, and Gordon PLEASE, when the day arrives give us a video of the great steek cutting…i have been knitting 25 years being able to avoid such a horror, but i know the day is coming…..
Glad you like the World War 2 blog—it’s early days yet, and needs more photographs and maps, but we hope to start to include them as things hot up. Even with a project like this we can only scratch the surface—it’s hard not to imagine what it must have been like to live through such times—for all nations. Veronica, well, I suppose red is a naturally warm colour—and that was a very lively red! I’ve just finished the inch of plain knitting above the welt (it’s been slow knitting this week), so now I have to wrap a wet towel round my head and work out the pattern!